Exclusive 12, 8, 5 or 3 Easy Payments on ADJ Mega Flat Pak 8 Plus Stage Lighting System only at AMS! Free 2 Day Shipping & Free Extended Warranty. Call our Gear Experts at 800-319-9043 for expert advice! 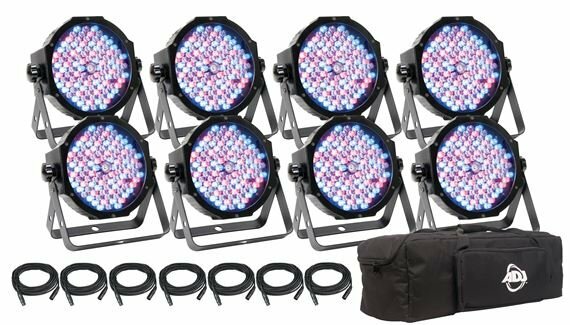 The ADJ Mega Flat Pak 8 Plus stage lighting system from American DJ is the perfect all-in-one lighting solution for bands, DJs, and other mobile entertainers, packing powerful, energy-efficient LED lights into a compact and highly portable system. Featuring eight (8) of the popular ADJ Mega Par Profile Plus LED wash fixtures, seven (7) matching 6-foot DMX connector cables, and a soft-sided carrying case that protects the whole setup from routine dust and load-in scrapes, the ADJ Mega Flat Pak 8 Plus has practically everything you need to transform your audience’s experience from humdrum to dazzling. Anchored by the dependable ADJ Mega Par Profile Plus slim design fixtures with ultra-bright LED lights, the ADJ Mega Flat Pak 8 Plus stage lighting system brings custom ambiance to any live performance, DJ show, or event. Whether your desired application is up-lighting, stage washing or wall washing, this highly-versatile package will get the job done. The twin technologies of RGB color mixing plus UV black light—combined with 32 built-in light shows and 64 color macros—puts a practically unlimited number of color combinations and effects into your bag of tricks. In fact, each Mega Par Profile Plus unit in this eight-light system comes loaded with an entire library of automated programs, which can be fired up at preset tempos or synched to live or recorded music using the Sound Activation mode. Individual light controls and a master/slave chaining option allow you to create harmonized, multi-fixture light shows. Don’t let these extraordinary capabilities give you the impression its overly complicated, the ADJ Mega Flat Pak 8 Plus stage lighting system is easy to set up and use, right out of the box! As with all American DJ LED lighting products, ADJ Mega Flat Pak 8 Plus offers significant advantages over traditional incandescent lighting systems. Relatively cool operating temperatures, a watt-sipping power draw (16W max) and a long service life are just a few of the benefits you can expect from this system, along with incredibly rich and vivid illumination. ADJ has been an industry pioneer in bringing affordable LED technology to the masses, and this kit shows how dedicated they are to keeping “green” values in all that they do. Each light in the system includes a scissor yoke for easy floor or wall mounting or attachment to a stand (sold separately). The thoughtful engineers at ADJ even placed the DMX ins and outs on the side of the lights rather than the rear, allowing easy mounting to an inside truss without the need for a hanging bracket. A wireless remote, ADJ LED RC2 (also sold separately), places responsive, on-the-fly control over the entire system in the palm of your hand. For versatile and affordable LED technology in a powerful yet easy-to-use package, the ADJ Mega Flat Pak 8 Plus stage lighting system is the right solution for bands, DJs and live events. I am extremely happy with this product. They are extremely bright! I just used them for a Harry Potter Themed wedding in a gymnasium and got stellar reviews from the bride! I would highly recommend this product! Works better than I expected . These lights pack a big punch in a small package . Brilliant colors with great washes . Works great with any light software can’t complain!!! I used this 8 pack for uplighting at weddings and it worked great. Good color spread and control. ADJ is a well known lighting company, and these are no exception. i run these with a controller and use them for DJ shows, karaoke shows, weddings and band gigs. The 30 degree beam angle is a nice combination of a beam and a wash fixture. If you want a great all round base for a lighting show, this is a great start! Now, AMS was easy to order from, shipped fast...you can be sure ill be ordering again soon!! Really like these lights, many possibilities. The lights are great. Bags is cheap and wears out quickly. Most of the lights have something loose on the inside.